What do you call an amino acid supplement with natural energisers and antioxidants? 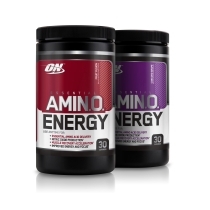 ON calls it Essential Amino Energy. Essential Amino Energy is the first product of its kind in the UK market to support recovery before, during and after exercise. It combines an optimal ratio of rapidly absorbed free form amino acids- including muscle building BCAAs and arginine for more intense vascular pump – with natural energisers, beta Alanin, and N.O. boosting ingredients to support longer, harder efforts in the gym and help you reach your next level. And, at just 10 calories per serving it makes a big impression without denting your diet. Because you choose how many scoops to mix into a glass of cold water, Essential Amino Energy is perfect for any occasion. Mix up a refreshing fruit-flavored drink to wake up in the morning, for pre-workout priming, to support post-workout muscle recovery or as a late afternoon pick me up. The powder easily mixes with water to create a refreshing fruit-flavoured drink and the potency can be increased or decreased to individual tastes and needs. Anytime’s the right time to enjoy new Essential Amino Energy!